Jessica Alba In A Tesla !? Jessica Alba has been seen cruising around in an Audi A8 for a while now. Just recently though she posted a picture on Instagram of her in what appears to be a Tesla Model S with a Space X baseball cap on! Though we don’t know for sure if this is her new ride, we wouldn’t be surprised as it fits her companies image a lot better than a murdered out Audi A8. We will be sure to keep you guys updated when we find out more! Thank you Anders for the tip! Jessica Alba and Cash Warren have owned their fair share of BMW’s over the years (all the way back to Jessica in this E46 M3), and earlier this week they were spotted getting out of their latest model, a new BMW X6. Jessica Alba goes through her fair share of cars and her latest addition is no surprise since she’s had an Audi before. 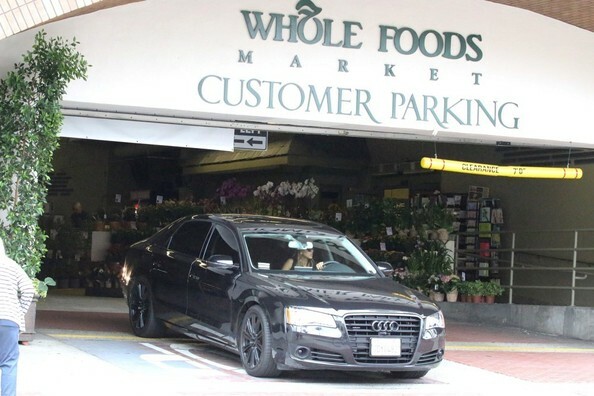 Jessica was spotted leaving a grocery store in Los Angeles with her new Audi A8 L earlier this week. With blacked out badges and black wheels, Jessica is rolling pretty tough now. Jessica Alba and her husband Cash Warren were spotted in a BMW 750i over the weekend. The new BMW 750 must be an upgrade from their older BMW 5 series. Jessica Alba’s usually running around in her Audi Q7 but while she was in New York city this week she was spotted riding shotgun in a Lexus RX.